OUSD plans to appoint a director to BayTech's board while an ongoing investigation delves into allegations of financial mismanagement. OUSD officials are trying to stabilize the tottering organization. Amid a management crisis and allegations of fraud at Oakland's BayTech charter school, the Oakland Unified School District is exploring the possibility of appointing an independent director to the school's board. State law allows public school districts to make board appointments to charter schools under their supervision. BayTech has also hired Kathleen Daugherty, a retired superintendent from Sacramento who runs an education consulting firm, to assist with the school's recovery. Classes began on Monday at BayTech, even though the school's principal and several other senior administrators all abruptly quit at the end of the last school year. Meanwhile, OUSD is continuing to investigate allegations that the school's former principal, Hayri Hatipoglu, defrauded BayTech by modifying his employment contract to obtain a lucrative three-year payout, instead of a standard six-month severance package. BayTech's three current board members, Fatih Dagdelen, Kairat Sabyrov, and Volkan Ulukoylu, allege that Hatipoglu made the contract modification without their knowledge. But Hatipoglu wrote in an email to the Express that the allegations are untrue and have unfairly damaged his reputation. "This allegation is such a big lie that even OUSD, CSMC (BayTech back office) would be able to refute that immediately as they can view/have access to school finances," Hatipoglu wrote. OUSD hasn't commented about the school's situation or the allegations against Hatipoglu except to confirm several weeks ago that the district is conducting an investigation. School district records show that OUSD has obtained detailed financial information from BayTech. Hatipoglu's employment contract, which is on file with OUSD, provided him with a three-year term of employment at an annual salary of $142,992, and if terminated without cause by either the school or Hatipoglu, BayTech is obligated to pay in one lump sum the remainder of the salary owed for the contract's full term. In a June 27 email sent by BayTech board member Kairat Sabyrov to OUSD's charter schools compliance specialist Leslie Jimenez, Sabyrov claimed that Hatipoglu originally proposed giving himself and several other administrative staff fixed-term contracts to create more stability at the school. Sabyrov wrote that these fixed-term contracts were considered at a March 8 board meeting, and that Hatipoglu presented them as having a six-month duration. The board agreed and signed off on the new employment agreements, according to BayTech's board records posted on the school's website, but the term length of the contracts aren't mentioned in these records. According to Sabyrov, Hatipoglu later swapped out pages in the contracts to change the terms from six months to three years. He then sent these back to Sabyrov to memorialize in the school's board meeting minutes, Sabyrov alleges. Hatipoglu has maintained in emails sent to the Express that Sabyrov's allegations are false, and that he is instead being retaliated against for breaking ties with the Accord Institute. Accord is a nonprofit that was founded by members of the Gülen movement, a Turkish religious sect run by the elderly imam Fethullah Gülen. In an email sent over the weekend, Hatipoglu wrote that Sabyrov, who is originally from Kyrgyzstan and BayTech's two Turkish board members are part of a "shady network that is exploiting the school's resources." Hatipoglu didn't specifically identify this "shady network," but BayTech's links to followers of Fethullah Gülen are well-known. The school was founded by Gülen movement members, including the current CEO of the Accord Institute, and BayTech has contracted with several companies that are suspected of being owned and operated by Gülenists. BayTech also paid the Accord Institute about $70,000 a year for various education training services. Fethullah Gülen and his followers have been accused by the Turkish government of plotting the 2016 coup against Prime Minister Recep Tayyip Erdogan. Founded in the 1970s and described as a moderate Islamic sect, the Gülen movement is known for creating extensive business networks and employing one another and tithing portions of their profits and salaries back to Fethullah Gülen. They're also known for hiding their affiliations with the Gülen movement, partly because the Turkish government has arrested thousands of Gülen's followers. According to Sharon Higgins, an Oakland resident who has spent years researching Gülen charter schools, BayTech uses its students as a source of funds for the movement. "Everything they do is about finding ways to skim money off the top so it can be sent to the Gülen movement's coffers," she wrote in an email to the Express. Higgins pointed to BayTech's student uniform contract. For years, BayTech students have been required by the school to purchase BayTech-branded clothing. If they don't wear the uniforms, students can be suspended and even expelled. Earlier this year, OUSD found that BayTech violated state education laws when it required students and their families to purchase the uniforms only from the school. The practice of requiring uniform purchases went on for several years, according to school staff who asked not to be identified for fear of retaliation. The manufacturer of these uniforms is the Garden Grove-based company Promotion & Beyond, Inc. According to state records, Promotion & Beyond was incorporated by Ismail Demirkol in March 2015. The company set up a website, BayTechSchoolStore.com, to sell uniforms to BayTech students. Promotion & Beyond also has exclusive deals to sell uniforms to other Gülen charter schools in Nevada, Southern California, and Arizona. Demirkol confirmed for the Express that his company has had a contract with BayTech for several years to sell student uniforms, but said he is unaware that OUSD sent a notice of concern to BayTech about the uniform requirements. Asked whether he or anyone else with his company are members of the Gülen movement, Demirkol declined to answer and said, "please never ask that one." Requiring students to buy uniforms from the school isn't the only way that BayTech has violated state education laws. According to OUSD, BayTech also forced graduating 8th and 12th graders to purchase caps and gowns from the school, and their family members were required to buy $10 tickets to attend the ceremony. OUSD authorities ordered BayTech to put a stop to these practices on June 8, according to a notice of concern sent to the charter school's board and interim co-principals by Leslie Jimenez, OUSD's charter school coordinator. In a separate notice of concern sent a week earlier, OUSD officials warned BayTech leaders that they repeatedly violated California's Brown Act, which requires that charter schools provide public access to meetings. According to OUSD, BayTech's board convened meetings in February that were essentially secret because no notices or agendas were posted to inform the public. The school board also convened meetings via email without notifying the public. The purpose of one of these online meetings was to recruit a new board member. The potential replacement was a Richmond resident originally from Turkey. 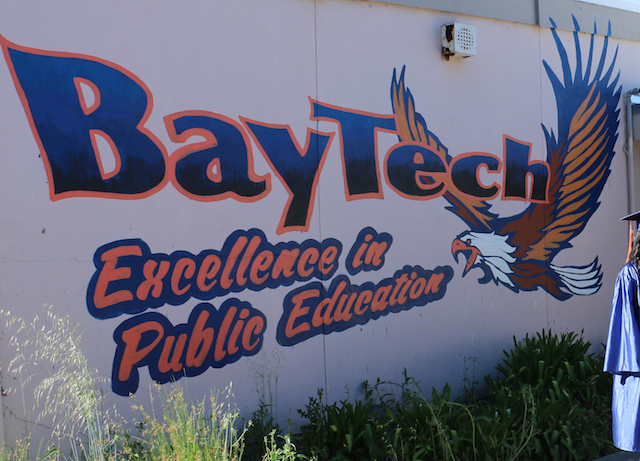 In March, BayTech's school board failed to post agendas for two separate board meetings on BayTech's website. And in May, the board posted an incorrect date for a board meeting and then issued an agenda after a mandatory deadline, thereby hampering the public's ability to participate. Furthermore, OUSD found that three of the school's board members withheld documents from two board members. The recent notice of concern sent by OUSD to BayTech didn't identify which board members were prevented from accessing the records, or what specifically the records pertained to. Two of BayTech's current board, Dagdelen and Ulukoylu are Turkish while Sabyrov is Kyrgzstani. When asked at the school's board meeting last week if the school is linked to the Gülen movement, both Dagdelen and Ulukoylu declined to answer. For years, OUSD officials declined to take seriously BayTech's links to the Gülen movement. In fact, during the school's charter petition renewal process last year, OUSD Superintendent Kyla Johnson-Trammel and former charter schools compliance officer Silke Bradford wrote in a report that while the district has received multiple tips over the years that BayTech is a Gülen school, they concluded that the allegations were "racist attacks" against people of Turkish descent. Correction: the original version of this story stated that Kairat Sabyrov is originally a Turkish citizen. He is originally from Kyrgzstan.